Every day for the past two weeks Clark Dever and Joseph DiNardo have been on a plane traveling to a new city. Once there, they spend 12 hours sightseeing, eating and drinking before they get on another plane and head to a new city. In just the first few days of their trip they have seen Chicago, Seattle, Charlotte, N.C., Fort Lauderdale, Fla. and Washington D.C.
"Truth be told, we don't sleep that much," Dever said in a phone interview the other day from Boston's Logan International Airport. The duo woke up in Tampa, took a flight to New York, then one to Boston and finally headed out to San Diego late in the day where they planned to check out the nightlife. Each night, they get about two to four hours of sleep. "Usually between the time the bars close and the time we have to get up to catch a flight," Dever said. They are part of a group of people who are taking advantage of JetBlue's "All-You-Can-Jet" pass which gives them a month of unlimited travel for $599. Most have some type of gimmick and are blogging about the experience and posting updates on Facebook and Twitter. There is Blake Benthall, an aspiring musician and freelance web developer. His goal is to "record a simple song idea every time I fly." All are, of course, posted on his Web site. "It's been great. It's obviously very tiring and taxing at moments. I haven't had a good night's sleep. I mean, it's not going to happen," Ross said just after landing at yet another airport. "Even though I don't get to leave the airports, it's so cool to see all these different places and meet these different people"
While on the ground, he has done research for Wired readers about where they can find free wireless Internet access or on the best places to plug in a laptop. The goal of his trip has been "to get that piece of airport culture." "We didn't want it to be as much of a vacation but to find out what it would be like to be stranded in an airport for 30 days," Ross said. So what about showers? Ross said a few friends have given him passes to the premier lounges of other airlines. In the big international airports, they have showers for their members. When he's not near a lounge, Ross said he finds a bathroom and uses "a few tricks I learned from camping." For Dever and DiNardo the goal is the opposite: see the country and try to avoid the airport. The 25-year-old friends met when freshman at college in Buffalo, N.Y. Dever is a photographer and is "capturing kind of a snapshot of America at this moment." DiNardo was running the marketing department for a financial services company but decided to take this "a once in a lifetime opportunity." "I don't think there's been a chance before for people like us -- normal dudes without a ton of funding -- to travel all over the U.S," Dever said. Along the way, companies, restaurants and others give them free stuff hoping to be mentioned on their blog Twelve Hours in a City. So far, they have wrested alligators in Florida, been invited to the Dunkin Donuts corporate suite for a Red Sox game and been treated to a night out on the town by Austin, Texas bar owners. 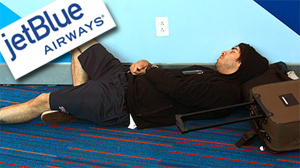 "I can now sleep from before takeoff through landing," DiNardo said right after waking from a nap in the Boston airport. "It kind of makes flying like teleporting when you can do that. It's a pretty cool superpower to have." They have never missed a flight and don't check their bags. Each day they spend on average just $30. The rest is left up to those seeking publicity or fans and friends who just let them crash on their couches. "We have a little bit of a cult following and interact with them on a regular basis," Dever said. In August, JetBlue launched the $599 pass. It is good for unlimited travel between any the airline's 56 international and domestic destinations between Sept. 8 and Oct. 8. The airline had never tried anything like this before and choose the typically slowest travel time of the year. The pass was originally supposed to be on sale for a week and a half but the airline quickly sold out of its "limited quantities." JetBlue spokesman Bryan Baldwin would not say how many passes were sold but noted that the airline canceled a planned advertising campaign because of high demand. "We had never done a campaign like this. We didn't quite know what the consumer interest would be," Baldwin said. "A lot of people took a look to see if it was something they could do even it was just a couple of weekends out of a month. The day after we put the passes up for sale traffic to route map online went up over 700 percent." For these travelers you might – painfully -- say that the sky is the limit. But not really. Tickets have to be booked three days in advance and, as Dever said: "We're kind of at the mercy of JetBlue's flight schedules." Dever said he switches snacks from flight to flight to keep things fresh. The pair have also started to get to know the various airport vendors at JetBlue's terminal at JFK and some of the gate agents and flight attendants. They also watch plenty of live TV on those JetBlue flights. "The goal is to watch a story about ourselves on a major news network on TV while we're flying," Dever said. "That's the breakthrough moment."